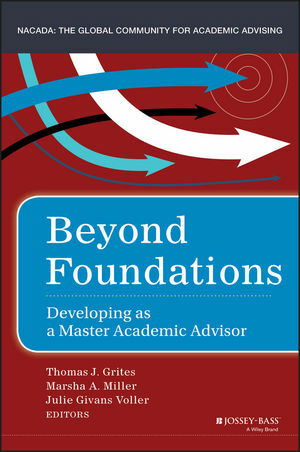 Beyond Foundations, a core resource for experienced academic advisors, gives practitioners insight into important issues affecting academic advising. In addition to gaining understanding of foundational concepts and pressing concerns, master advisors engage with case studies to clarify their roles as educators of students, as thought leaders in institutions, and as advocates for the profession. Pillar documents—the NACADA Core Values, NACADA Concept of Academic Advising, and CAS Standards—serve as sources of both information and inspiration for those seeking to improve advising. New strategies inform advisors helping a diverse student population delineate meaningful educational goals. Each chapter prompts productive discussions with fellow advisors interested in cultivating advising excellence. To promote advisor influence in higher education, experienced contributors explain new trends—including the impact of external forces and legal issues on postsecondary institutions—and the evolution of advising as a profession and a field of inquiry. Expert insight and practical focus contribute to the development of experienced advisors. Advisors must meet the expectations of students, parents, faculty members, administrators, and outside agencies, all while navigating an increasingly complex range of issues presented by a student population unlike any that has come before. Beyond Foundations provides the insight and clarity advisors need to help students achieve their educational goals and to advance the field. Thomas J. Grites is assistant provost at Stockton University, cofounder and past president of NACADA, and coeditor of Academic Advising: A Comprehensive Handbook, Second Edition (Jossey-Bass, 2008). Marsha A. Miller is the NACADA assistant director for resources and coeditor of Academic Advising Approaches: Strategies That Teach Students to Make the Most of College (Jossey-Bass, 2013). Julie Givans Voller is the research and planning strategist for the Maricopa Community Colleges and lead editor of Comprehensive Advisor Training and Development: Practices That Deliver (NACADA, 2010). NACADA: THE GLOBAL COMMUNITY FOR ACADEMIC ADVISING, an organization of more than 13,000 members worldwide, promotes student success by advancing the field through professional development, networking, and leadership.